Who says watching what you eat can’t be fun? 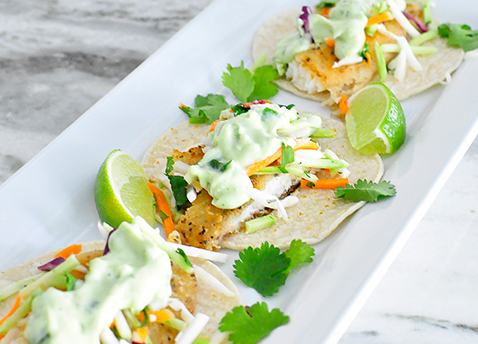 Take a pointer from Monica Wants It and try this calorie-conscious alternative to your favorite Street Tacos, featuring our Crisp Tilapia Fillets. 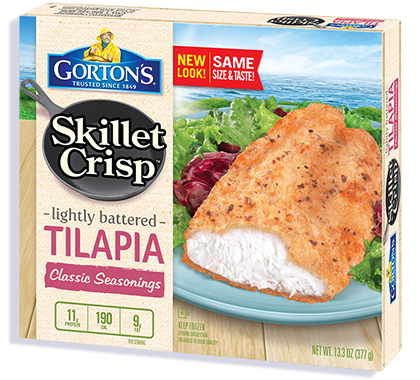 In a non-stick skillet, heat up the frozen Skillet Crisp Lightly Battered Tilapia fillets for about 18-25 minutes on medium heat. Flip every 5 minutes until golden brown and cooked. While your tilapia is getting nice and golden brown, make your slaw. In a bowl, simply combine the veggies, juice of one lime, cilantro and a dash of salt and pepper and mix together. Set aside. In another bowl, combine your ripe avocado (pitted and scooped out), sour cream, jalapeño (leave some seeds in if you want some heat), juice of one lime and cilantro. Mix well until it’s all incorporated and add in salt and pepper to taste. Heat up your mini corn tortillas in a flat griddle. Take your tilapia fillets out of the pan and put onto a cutting board. Cut each fillet into about three long strips. Then cut those strips in half. Top the corn tortillas with tilapia (one fillet should generously fill 3 tacos), a generous amount of the veggie slaw, and a heaping tablespoon of the dressing. Toss on some cilantro leaves and garnish with lime wedges. Marvel at your beautiful, colorful, healthy taco masterpiece.